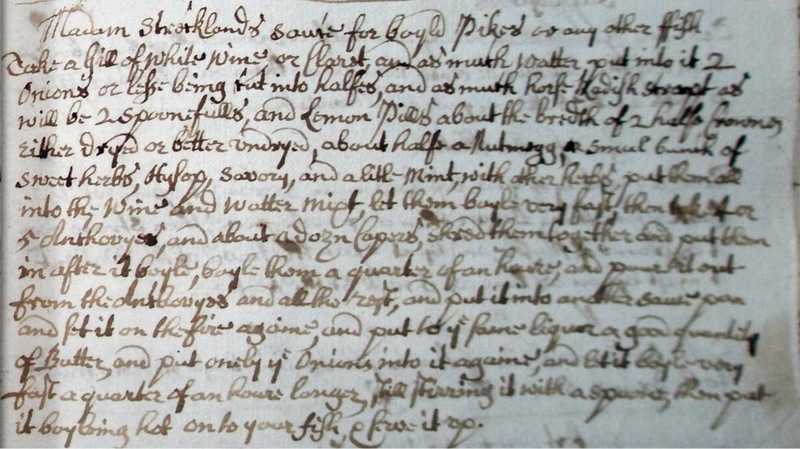 A pike roasted in front of the fire according to the directions in Elizabeth Birkett Here Booke 1699. It is stuffed with pickled herring, herbs, spices, anchovies, butter and garlic. I am currently working on a project at a wonderful seventeenth century house not far from where I live in the Lake District in a stunning village called Troutbeck. The property, which is called Townend Farm, is now in the ownership of the National Trust, but for many centuries was the former home of the Brown family. The Browns were 'statesmen', a local term for farmers who were proprietors of their own land. Statesmen farmers were a fiercely independent bunch who valued education. The Browns were no exception. Over many generations they built up an extensive library and never threw anything away. A vast collection of their domestic papers has survived, leaving a remarkable record of the minutiae of domestic life in this beautiful house over nearly four centuries. 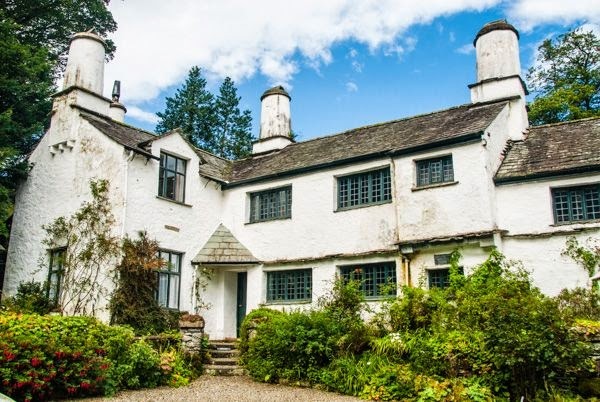 Townend Farm, Troutbeck, Cumbria - perhaps the best surviving example of a Lake District statesman's house. Among the papers is a small hand written collection of medical, domestic and cookery recipes which was compiled in 1699 by Elizabeth Birkett, also from Troutbeck, who married the house's owner Benjamin Brown in 1702. With my help, the National Trust are using this book, which is now on display at Townend, to interpret the domestic life of the house as it was in Elizabeth's day. 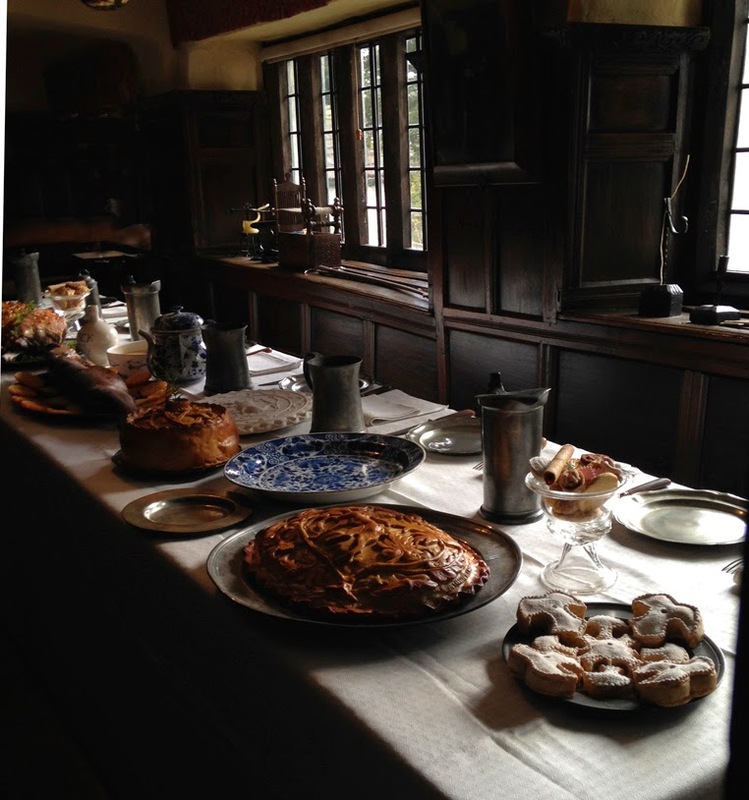 I have trained the staff to cook some of her recipes in the 'downhouse' (kitchen), so every Thursday visitors are treated to 'A Taste of Townend'. I have also set up the 'firehouse' (best room) with a table laid with typical dishes of early eighteenth century Lakeland. One of these is a replica of Elizabeth's roast pike recipe. 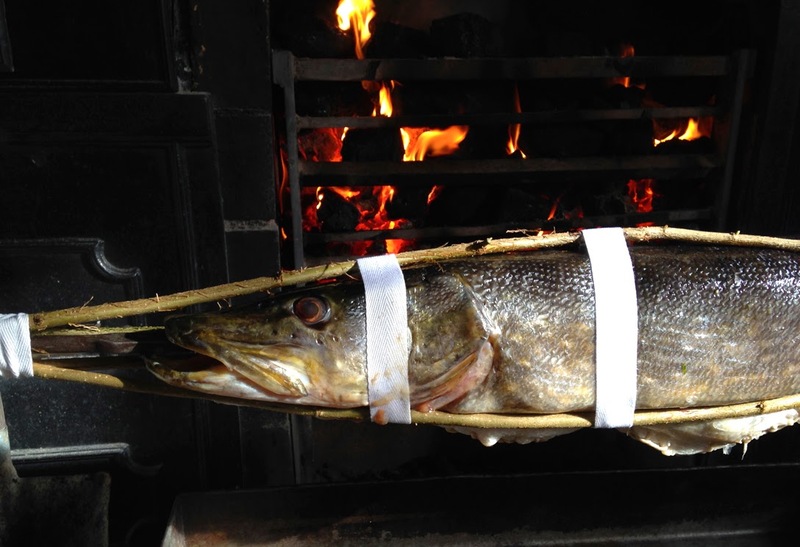 In order to make this very convincing replica, I had first to roast a real pike using her directions. 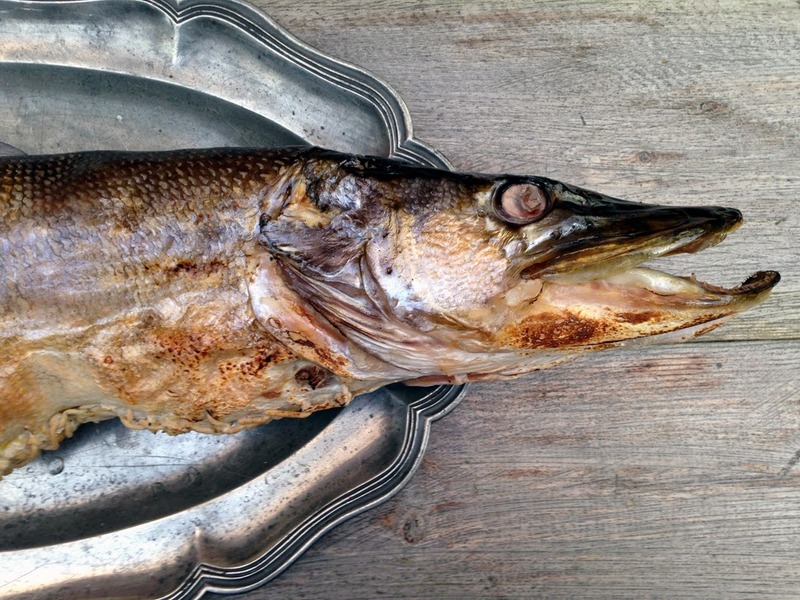 Elizabeth's 1699 recipe for roasting pike, a fish which has always been plentiful in the English Lakes. 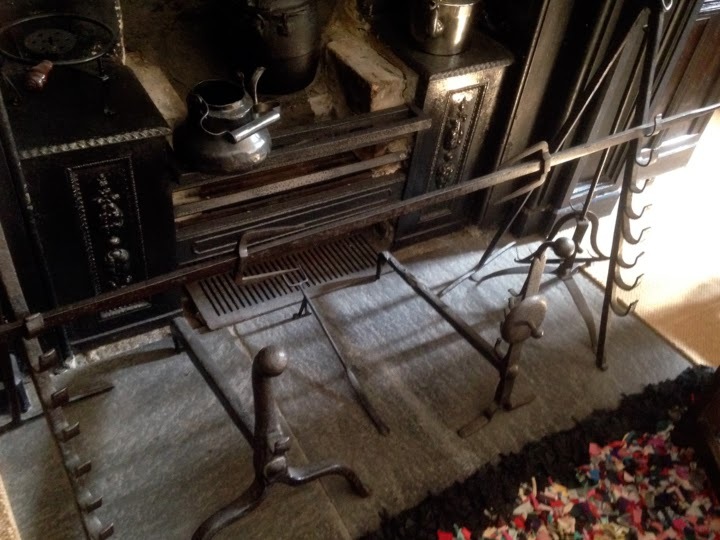 Although they are displayed in front of a nineteenth century fireplace, the cob irons and spit in this photograph date from the lifetime of Elizabeth Birkett. It is just the sort of arrangement that could have been adapted for roasting a large fish such as a pike. 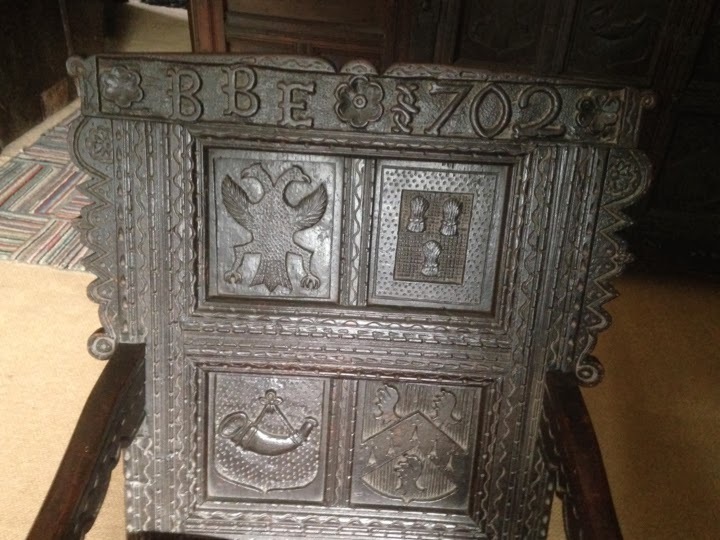 This wainscot chair is carved with the initials of Benjamin and Elizabeth Brown and 1702 - the date of their marriage. It was however, carved much later than this. 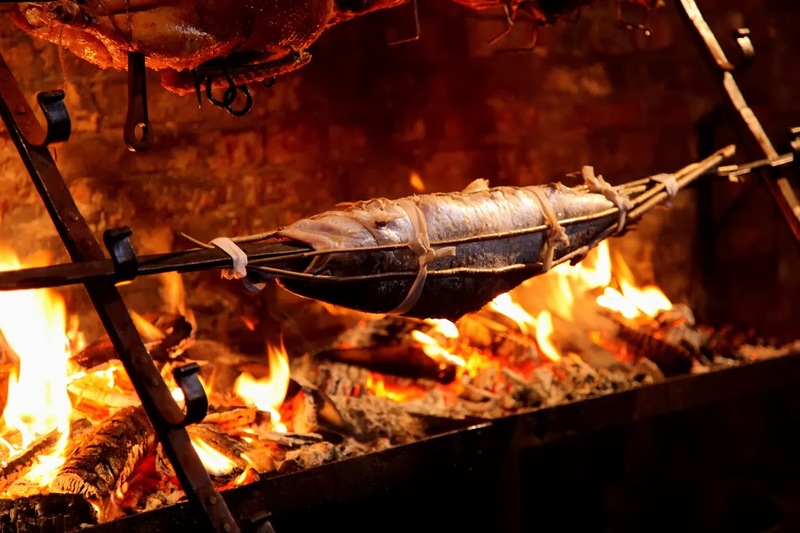 To roast a large fish like a pike on a spit requires a technique sometimes called 'splinting' which involves lashing hazel wands around the fish to create a cage. This prevents the fish falling off when it starts to cook and become fragile. Elizabeth must have used this method, though she does not mention it in her recipe. A very full account of the technique was given by Isaac Walton in The Compleat Angler (London: 1653) in a recipe which is very similar to that of Elizabeth. However, Walton suggests filling the pike's belly with oysters, while Elizabeth gives the alternative of pickled herring. I have tried both recipes and they are equally good. I always use Walton's directions to splint the fish with lathes and filleting. 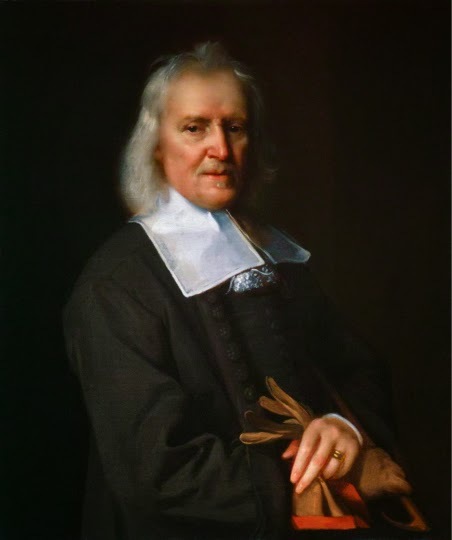 Isaac Walton (1594-1683) by Jacob Huysmans. From Isaac Walton, The Compleat Angler (London: 1653). A Windermere pike about to be lashed to a spit with a cradle made of hazel lathes and tape (filleting). A salmon cooked using the same method. This was roasted at Gainsborough Hall a few months ago. Note the similarity of the cob irons to those at Townend Farm. 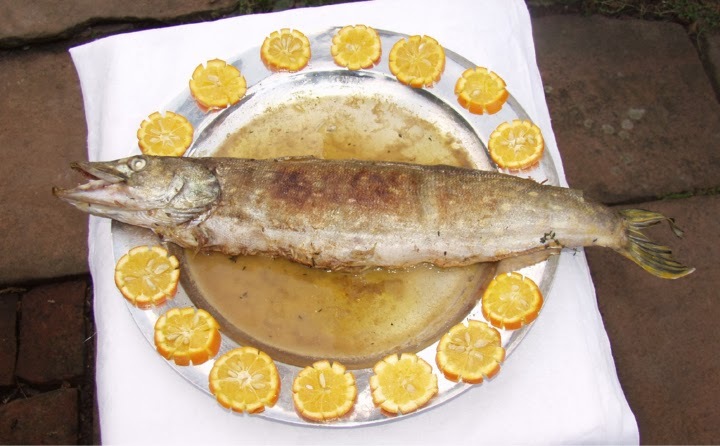 A pike roasted to Elizabeth's recipe and garnished with jagged Seville oranges. 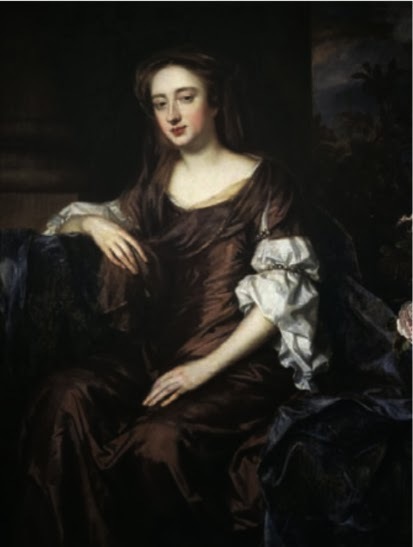 A recipe for a sauce for boiled pike in Elizabeth's hand, but given to her by Lady Winifred Strickland of Sizergh Hall. Winifred Trentham Lady Strickland, by William Wissing. Courtesy NT. Elizabeth's recipe book contains a number of old charms for various ailments that would have been frowned upon as 'papist' in late seventeenth century Westmorland. There are also a number of recipes from local Catholic recusant families such as the Braithwaites of Burneside and most notably from the Stricklands of Sizergh Hall. I have reproduced Madame Strickland's sawce for boyld pike above. After the Glorious Revolution of 1688 Lord and Lady Strikland went into exile in France with James II. It is possible that Elizabeth's family were Catholics. I will deal with some Elizabeth's other recipes in future postings.